January 2012 - TMRnyc - Total Metal Resource, Inc.
You know the concept: make the house look good from the outside to give a good first impression before buyers even cross the threshold. The same holds true for commercial spaces, particularly when you’re looking to increase foot traffic. One way we like to help local business owners increase their curb appeal is by creating pieces through custom metal fabrication NYC shops can use to attract customers. Even better, we make those unique metal products functional, so they’re more than eye candy – they’re usable, durable pieces of art that serve an actual purpose while also bringing in passersby. 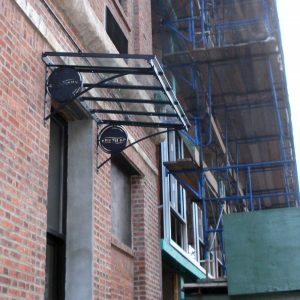 Sometimes, a project like this is as simple as creating a unique awning for a storefront, as we did for the lofts at 44 Berry. This is a piece of custom metal work NYC residents in the area pass daily, and it serves as an address sign, awning, and artistic expression of the building’s overall feel. For a restaurant, this type of external “branding” can be extremely attractive to potential diners, and that’s always money well spent. Instead of the standard fare tables and chairs, you can create a bistro feel for your restaurant’s outdoor patio by having us create some customized small metal tables NYC commuters love for convenience and ambiance. 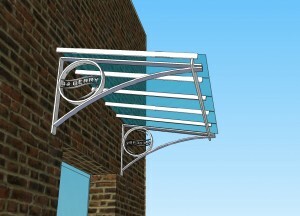 Set them under a specialty awning and pair with some chic lighting from our electrically inclined metal fabricators: NYC meets Paris right on your front patio. What does your storefront say about you? Give TMRnyc a call and see how we can bring the indoor feel of your shop out into the light. Whether at home or at work, lighting is an important part of every décor. The right lighting can make a difference in how your furniture looks (especially that cool custom metal furniture!) by casting different levels of light and color, how comfortable the room is for reading or conversation, and how the atmosphere of the room feels. Without the right lighting, your space can feel too bright, too dark, or uninspired. But with a little custom metal fabrication, NYC homes and businesses alike can have those unique metal products that create just the right finishing touches no matter where you need them. True, usually we’re busy at TMRnyc making our super manly belt buckle, The RetroCard Belt Buckle; or our man-cave fave, The Pipe Bomb Bar. Or we’re off installing hanging window baskets or a custom sign or … you get the picture. But we dig getting our electrical groove on with some lighting fabrication. And yes, it’s all UL-listed and all that good stuff. 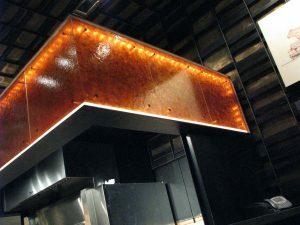 New York diners can catch glimpses of some of our handiwork over at Colicchio & Sons, where we installed some super cool custom lighting to make their oven hood glow like a burning ember. Whether you need a massive lighting installation for your customized, wood-burning, industrial oven, or you just want some kickin’ sconces for your patio, TMRnyc has your lighting needs covered. Plus, we can make it all mesh and match with the rest of your custom metal furniture, because we’re cool like that. Contact TMRnyc for your custom metal fabrication needs.